This leading edge TDR can test more system bandwidth and expose faults that have bee previously invisible to TDR yet still an impairment to digital signals. The TV220 also introduces one-button testing. Because the TV220 tests at a high bandwidth (it uses a 400 MHz acquisition system), it tests more of your system capacity. This enables users to pinpoint more faults that can cause micro-reflections which can degrade digital transmission BER. Only the TV220 has the bandwidth to enable you to find problems that may exist only at higher frequencies. The TV220 also has extremely high signal-to-noise ratio (SNR). Tempo proprietary circuit designs reduce the noise level so that "bumps" on the trace represent real faults, not just noise. Events that were previously difficult or impossible to find are clearly visible (because the noise is much lower) with the TV220. This means that you can clearly see faults further away. High-resolution performance allows the TV220 to locate problem components in the customer drop. The TV220 uses a pulse width of only 1 ns which means the operator can clearly identify multiple events that are less than 2 feet apart. This enables the technician to tell which of two components on a cable is causing the problem, even when they are close together. This is particularly important in troubleshooting drops, because components such as splitters and ground blocks can be very close together. But the most innovative feature in the TV220 is TestWizard automated testing and event marking. Now, instead of meticulously setting up the TDR and then carefully interpreting the meaning of the displayed waveform, you push one button to get a high-resolution, low-noise trace, with the events clearly marked. This means substantial savings in training time and reduced time to get accurate, repeatable measurements. High bandwidth, high resolution, high SNR and ease of use make the TV220 the only logical choice for digital services. The TV220 tests more of the capacity of your cable, finds faults that are closer to the ends and finds faults that are closer together than any other TDR available. Any TDR can find a break or major problem, but what about those small nagging cable faults that keep your system from running smoothly CableScout TV220 can find those really tough-to-identify problems, and it is easy (see examples below). A high performance TDR does not have to be difficult to use. This one makes even the first time user look like a pro. 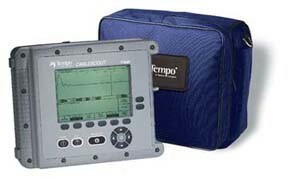 If your job is to maintain or find faults on coaxial cable, the Tempo CableScout TV220 is built for you. With the TV220, you'll spend less time operating the instrument and more time analysing and repairing faults. You get all this performance in the industry's most rugged TDR package.